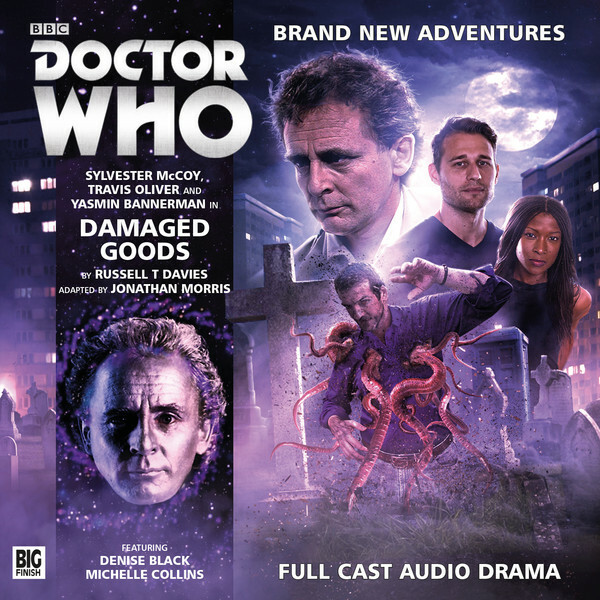 Doctor Who: Big Finish - DAMAGED GOODS Review | Warped Factor - Words in the Key of Geek. Tony Fyler is a damaged individual. I write this knowing nothing of the original book of Damaged Goods except that it was written by Russell T Davies, having made the classically Fylerian (for which read ‘wrong-headed and asinine’) decision to give up on the Virgin New Adventures after the Timewyrm novels. Coming to it fresh as a Big Finish adaptation works for me though – what others might call a chronic lack of contextual understanding, I’ve decided to call a freshness of mind. So there. Coming to it cold, I’d say it works extremely well – IF you’re a fan of the RTD style of storytelling, because let’s get this clear right now: despite being adapted by Jonathan Morris, this feels like TV Russell T Davies Who, only with a bit of a racy drug theme in the middle. It’s got council estates, gay couples, guys from the future where they’re too advanced to care who you fancy, monsters from the Old Times, super-duper Time Lord weapons designed to fight the monsters from the Old Times, children, mothers, a big Deus Ex Machina, a couple of fairly needless, gruesome deaths, a rippling thrill of foreshadowing with the mention of our favourite sinister institute – hell, it’s even got a bunch of Tylers right at the middle of the storytelling, though they’re not the ones you’re expecting. So make your mind up to this before you go in: this is Russell T Davies…fest. Yes, yes, but is it any good? Again, that’s like asking whether RTD as showrunner was any good. If you think he was, relax, you’re going to enjoy this one. If not, move along, there’ll be something else along in a minute. This is, as you might expect given its heritage, a somewhat different Seventh Doctor to the one from TV, and it’s also notably a different one from the version with which we’re now familiar through Big Finish. If anything, it’s a Doctor less dark and brooding than either of those, a Doctor more light on his feet, more able to roll with the punches of situations that haven’t necessarily been under his control for the last thousand years, and – for all he makes a small speech about not being comfortable or at home in the urban environment in which Damaged Goods takes place – a Doctor more comfortable with the use of charm than a frown and a sullen silence. A Doctor, to be fair, more like Sylvester McCoy. If you go into this expecting the grand strategist from contests with Elder Gods, you might be a little disappointed. If you go in expecting a solid, recognizable yet less baggage-heavy Seventh Doctor, chances are you’ll enjoy him. Let’s talk companions. In fact, let’s cut to the chase and say yes. Travis Oliver and Yasmin Bannerman as Chris Cwedj and Roz Forrester respectively deal bravely and boldy with the fact that they have (technical writer’s term alert) naff-all in the way of plodding backstory. Boom, they’re there, and they’ve been with this Doctor a while – their dialogue makes you believe in them quickly, and their performances make you understand within the context of this story why they’re good enough to have been travelling with the Doctor for some time. Threats and storylines. Ohhhh boy. This, if anywhere, is where Damaged Goods could lose some people. Again, given the Elder God-battling of recent years in Big Finish, this is actually relatively straightforward stuff. There are, more or less, three storylines: a drug storyline, an ancient weapon from the dawn of time storyline, and a child storyline. The thing is, any one of them alone could probably have filled the storytelling space here. But the way those storylines relate and intertwine is where things feel a bit panel-beaten into shape against their will, and where there’s a dash of RTD ‘because I say so’ about things – some significant time is spent telling us that a pair of twins are linked and should never have been parted, only for the information to be flipped on its head in the space of a line, so that, having been parted for so long, they should never now be brought together again, as the consequences will be cataclysmic. Wa-huh? But the mention of an old-school Old Times monster gives the story a twist of a thrill in its anchor, and the use of a Time Lord relic puts the story very much in familiar Seventh Doctor territory, a la Silver Nemesis and Remembrance of the Daleks. The drug storyline feels a little like an author trying to go for ‘gritty, edgy urban realism’ when actually, it feels like a slightly clunky device, the purpose of which could have been just as easily achieved with E-numbers or preservatives as it is here with a drug called Smile. The child storyline is the real emotional heart of the storyline, particularly inasmuch as it becomes a tale of two mothers – there’s even a touch of the riddle of Solomon towards the end. Y’know, in among the ancient Gallifreyan living weaponry and the evil from the dawn of time threat which may or may not actually exist and the crazy-going drug storyline and all that – it would be fair to say that towards the end, Damaged Goods gets as hectic as a highway on a holiday, but it’s put to good use as Roz and Chris are despatched to deal with elements of an overstuffed plot-arc, allowing the Doctor to deal with that emotional heart we mentioned. All in all, while the drug storyline could be seen as unnecessarily urban and the child storyline goes through a bit of a logic-switchback, the quality of the characterization and some pacy direction from Big Finish stalwart Ken Bentley pulls you through Damaged Goods with your mind certainly more intact than, say, Zagreus or some of the later Elder God stories did, and at the end of it, you feel like what you’ve actually just listened to is something like the great unmade Doctor Who movie of the 80s. It leaves you feeling satisfied with its meatiness of plot and character, a little bit turned inside out, and perhaps most tellingly, ready for more.